The moment is drawing near. New York is buzzing with thousands of runners pouring in as they prepare to run this Sunday in one of the greatest pieces of urban theatre on the planet: The New York City Marathon. They started painting the line — a 26.2 mile long blue line stretching from Staten Island to Brooklyn to Queens to Manhattan to the Bronx and back to Manhattan — on Wednesday. About 43,000 runners — an army on foot — will make the journey (map). 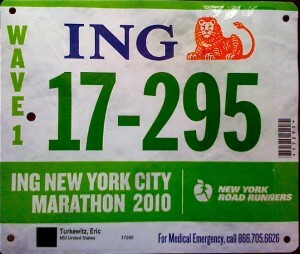 If past performance is any indicator of the future, about 97% will cross the finish line in Central Park. Want to know what’s it’s like inside the race? My Blawg Review #134 was themed on this race and can give you a sense of what it’s like to be inside of this 26.2 mile long block party. 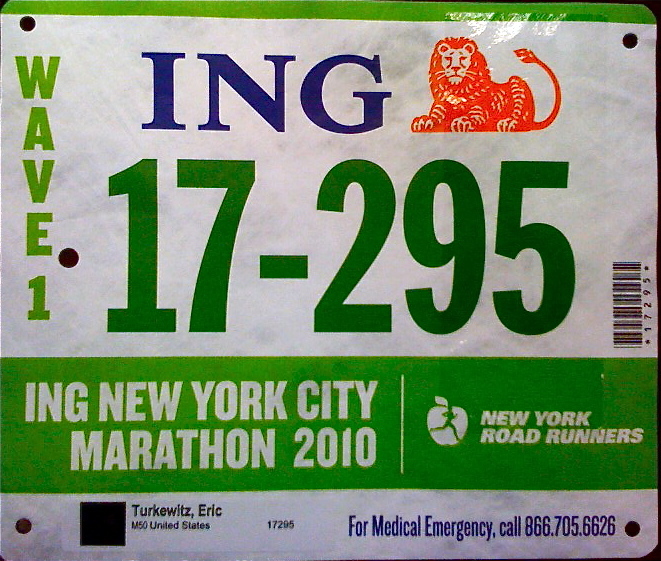 But I confess that it’s difficult to communicate the excitement of racing through the melting pot of Brooklyn, with people jammed cheek to jowl on 4th Avenue screaming in a hundred languages at us middle-of-the-pack runners; childrens’ arms stretched to the street to slap the hands of those passing. Or the thrill of coming down off the 59th Street Bridge into Manhattan, with its dramatic sweeping turn into the canyon of First Avenue, electric with noise. The best in the world have been known to get so juiced at the sight that they push too hard and consume the energy stores needed for later. Or the tight, twisting confines of the closing miles in Central Park, with people exhorting you on when your brain tells you to stop. Yeah, it’s pretty awesome. A crowd estimated at 2.5 million people. Bands galore. Even the cops and firemen cheer. It’s that kind of day. It’s now 40 hours till they fire the canon. Tick tock. Tickety tock.